Are you in need of quality garage door service in the Jericho, Vermont area? There’s only one name to know: Overhead Door Co. of Burlington. We have provided reliable installations, repairs and maintenance services for residential and commercial garage doors. We offer a myriad of high quality garage doors for installation and replacement projects in the Jericho, VT area, with popular options available like steel, wood and aluminum. Your garage door is a major investment, and the quality of the installation work is just as important as that of the product itself. 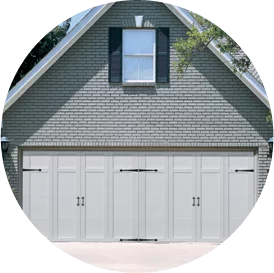 At Overhead Door Co. of Burlington, we offer the highest quality garage doors for our residential clients in Jericho and can help ensure smooth operation with proper installation and maintenance. Learn more about our residential garage door service in Jericho today! Having high quality, functioning doors in place at all times is critical for any commercial facility in the Jericho area. If your garage doors break or need to be replaced, service must be completed right away to ensure your property remains protected from theft and the elements. Overhead Door Co. of Burlington uses the best quality commercial door products, garage door openers and dock equipment. Learn more about our commercial door service in Jericho. When you choose our team to work on your Jericho area home or business, you can count on us. Whatever your needs, you can trust us to offer high quality products and service. We also offer more than just garage door services! Our team installs windows, trim and more. Ready to schedule services in Jericho, Vermont? Call us today at 802-448-4752!